Funimation is gearing up to premiere two more SimulDub series on Monday October 24th with Orange at 9:30pm ET, then Yuri!!! on ICE at 10:00pm. Ahead of the debut, they have announced the English dub cast for the two anime series. Synopsis: Second-year student, Naho Takamiya, receives a letter from her future self that warns of a tragedy to befall a shy boy she will come to know. Can Naho and a close group of friends change the future or must they live with a regret that can never be erased? 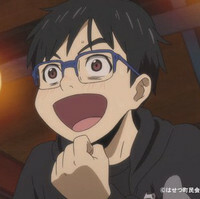 Synopsis: Yuri Katsuki makes his way to the Grand Prix ice skating competition as Japan’s top representative with his eyes on the prize. However, instead of celebrating, Yuri walks away defeated and ready to retire for good. But a run-in with champion Viktor Nikiforov and rising star Yuri Plisetsky ignites a new fire within him. With the two of them close by his side, Yuri will take to the ice once more.